Entering the playoffs, the No. 3 seed Portland Trail Blazers were one of the hottest teams in the NBA led by an explosive backcourt of CJ McCollum and All-NBA candidate Damian Lillard, who had jumped into the stratosphere of elite NBA guards. 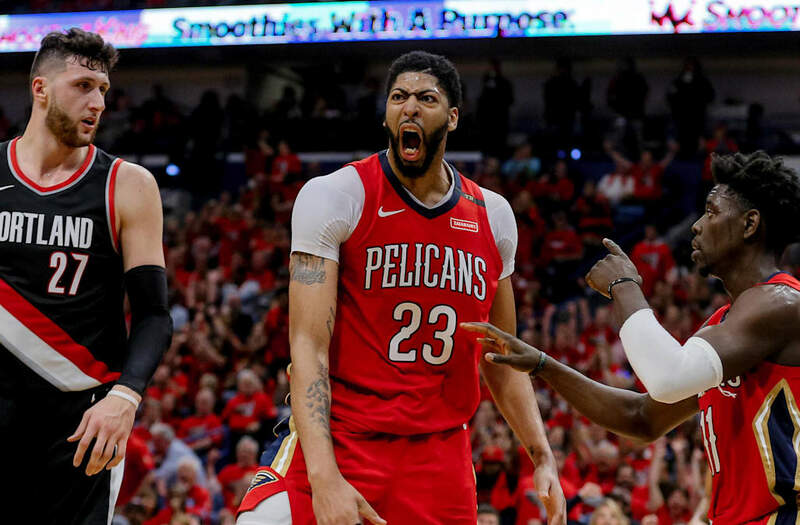 In the end, Portland was no match for “Playoff” Rajon Rondo, Jrue Holiday and the best player on the court, Anthony Davis, who led the 6th-seeded New Orleans Pelicans to a 131-123 Game 4 victory and series sweep of the Blazers on Saturday. It was a chippy game, as the frustrations of an overwhelmingly disappointing performance surely weighed heavy for the Blazers in front of an energized Pelicans home crowd hungry for playoff success. A pair of scrums broke out in the first half, resulting in five technical fouls and a flagrant foul on McCollum for a hard foul on a driving E’Twaun Moore. In the end, no punches were thrown, in typical NBA fashion, but emotions were high in the Smoothie King Center. It was a coronation for Davis, who has long carried the mantle of best player in the NBA without a playoff victory. Davis was dominant throughout the series for his first playoff wins in his sixth season. He averaged 28.3 points, 12.7 rebounds, 2.7 blocks and 2.3 steals through the first three games before dropping a monster line of 47 points, 11 rebounds and three blocks on Saturday. Meanwhile, “Playoff” Rondo proved to be a real thing once again, as the veteran point guard stepped up his game against Portland. After posting averages of 8.3 points, 8.2 assists and four rebounds during the regular season, Rondo was good for 12.7 points, 12.3 assists and seven rebounds through the first three games. He dropped seven points, 16 assists and seven rebounds on Saturday. Meanwhile, Holiday gave Lillard fits on defense throughout the series. Lillard, whose averages of 26.9 points, 6.6 assists and 4.5 rebounds even earned some MVP whispers late in the regular season, was nowhere close to form during the series. He shot 32.7 percent from the field through three games while averaging 18.7 points and five turnovers against the long arms of the Pelicans guards. Saturday’s 19-point performance while hitting 1-of-5 three-pointers added up to another subpar effort. Holiday did plenty of damage on the offensive side as well, averaging 23.3 points, six assists and 4.3 rebounds through three games before exploding for 41 points, eight assists and three rebounds on Saturday. The Pelicans will have some time to enjoy their first playoff series win since 2008 before taking on the winner of Golden State-San Antonio. The Trail Blazers, meanwhile, have some soul searching to do.